The preparation of a dialogue sound track for a film sequence which, for convenience, has been shot silent or with only a low-quality sound ‘guide’ track. Reference to the ground floor plan will show the general arrangement of the suite. Flexibility has been achieved mainly by deviating from the normal commercial film dubbing arrangement in which the sound mixing equipment is placed in the theatre with the commentators’ room adjacent. The sound-mixer at the mixer desk checks sound quality in a room which is similar in size and acoustical properties to that in which the viewer at home hears the finished product. When the theatre is being used solely for review work, the mixer room is freed for disk-to-film and/or film-to-film dubbing in conjunction with the recording room. In addition, maintenance can be carried out in these rooms without interference to film viewing. The theatre can be used as a small film studio, the sound being monitored in the separate mixer room. Post-synchronisation* is simplified. The suite provides a sound studio and mixer room for use on transmission, when not required for dubbing or recording work. In practice the facility of being able to run the equipment at 24fps was not used and everything was run at 25fps. 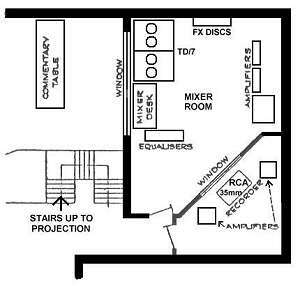 An additional step towards speedy operation and flexibility was to place the recording machine and operator in a room directly behind the mixer room with a large intercommunicating window. Much of the equipment installed in the suite, and to some extent also the operational technique that has been adopted, conform to standard practice in the film industry, which has been described elsewhere* and so is not dealt with in any detail in this article. Some features of the suite at Alexandra Palace are, however, peculiar to television film production, and these are discussed in the following paragraphs. A basic requirement for film production equipment is that all the individual machines, projectors, soundheads, recorders, and picture cameras, shall run at the same speed. In addition it should be possible to run up certain parts of the equipment in synchronism. At a television film production centre it is important also to be able to run the equipment at either 24 or 25 frames per second, for reasons which are explained below. Coupled to these requirements is the need to be able to group the equipment in a number of different combinations; to run equipment at exactly 25 frames per second when recording or dubbing, irrespective of the frequency of the mains supply; and to connect to the system, when required, a mobile recording truck. All these requirements are met at Alexandra Palace. From Fig. 2, which shows the drive and power-supply arrangements, it will be seen that a Selsyn drive system has been provided in order to ensure that the picture and sound tracks run up to speed in synchronism, as in the normal film studio arrangement. Each sound reproducer and projector is provided with a Selsyn motor, all of which are controlled by a central Selsyn distributor driven by a synchronous motor. The standard speed for 35mm film in the cinema is 90 feet per minute, corresponding to 24 frames per second. 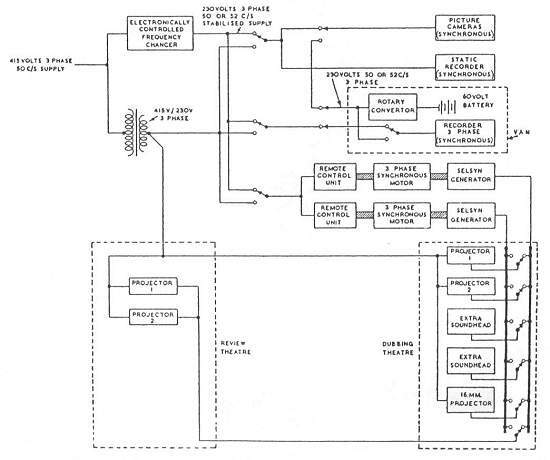 The design of television film transmission equipment for this country, however, is eased very considerably by running the film at 25 frames per second, because this is the interlaced picture repetition rate of the British television system, and all modern film scanners here operate at this rate. While the resultant speeding up of the picture images of a standard film is normally undetectable, the pitch of the sound is raised to a degree that is very easily discernible by the ear, and it is therefore desirable, in order to obtain absolute sound fidelity, that all films destined for television film transmission should be produced at 25 frames per second. This requirement has been met at Alexandra Palace by feeding from a frequency changer capable of producing 52.08 c/s all the film production equipment designed to operate from a 50-c/s supply at 24 frames per second. With this arrangement, standard film equipment can be run at 25 frames per second without alteration, and, moreover, a quick reversion to 24 frames per second can be made if required. The frequency changer can be adjusted to provide any frequency between 45 and 55 c/s. Its output is independent of mains frequency and voltage variations, and is closely stabilised. A D.C. motor alternator set is used, which is supplied from a rectifier system across the A.C. 3-phase, 415-volt mains. In this way a supply independent of mains frequency is obtained, and the problem resolves itself into stabilising and providing adjustment of the output frequency. A permanent-magnet generator, which is coupled to the alternator shaft, produces a D.C. voltage that is strictly proportional to the shaft speed. A second D.C. voltage is obtained from a current transformer and a rectifier connected in one phase of the alternator output. These two voltages are biased in a potentiometer network against a 45-volt dry battery, and the resultant voltage is applied via a 2-stage D.C. amplifier to a booster set that controls the speed of the driving motor, as shown in Fig. 3. Thus the required output frequency can be obtained by suitably balancing the D.C. bias voltages, and variations in output frequency due to variations in the load or the voltage of the incoming supply are automatically compensated. The output voltage of the frequency changer is controlled and maintained by an ‘Isenthal’ regulator system. The output frequency can be set locally or remotely in the film recording room where a wide-scale frequency meter of high accuracy is provided. The frequency changer is designed for continuous running, and after an initial half-hour settling down period, it maintains the output voltage constant within 1 per cent. and the output frequency within ± 0.1 per cent., irrespective of mains variations as great as + 5 per cent. Although the output frequency stabilises within 2-3 seconds after a change from no load to full load, this period of instability is sufficient to cause a very slight, but none the less noticeable, fluctuation in the speed of a sound reproducer or a recorder connected to the frequency changer. For this reason the switching arrangement shown in Fig. 2 has been provided so that for those operations not requiring first-class frequency stability the machines can be operated from the supply mains, thus releasing the frequency changer for recording operations. To prevent a dubbing session being carried out with the reproducers and recorders running at different speeds, which is possible with this switching system, a signal light, which lights up only when all the equipment is connected to the frequency changer, is fitted on the recording mixer desk. In order that the projectors may be run at 25 frames per second from mains supplies, synchronous driving motors with gearing have been fitted, in addition to the standard Selsyn drives which give a speed of 24 frames per second from a 50-c/s supply. It will be seen from Fig. 2 that a 3-phase mains supply and a 3-phase controlled supply from the power room and from the recording van are fed to the television studios, so that 35mm picture cameras can be operated there in synchronism with the static or mobile recorders. Although an ambitious and flexible system, the facility for using a tv studio as a film studio was not employed.